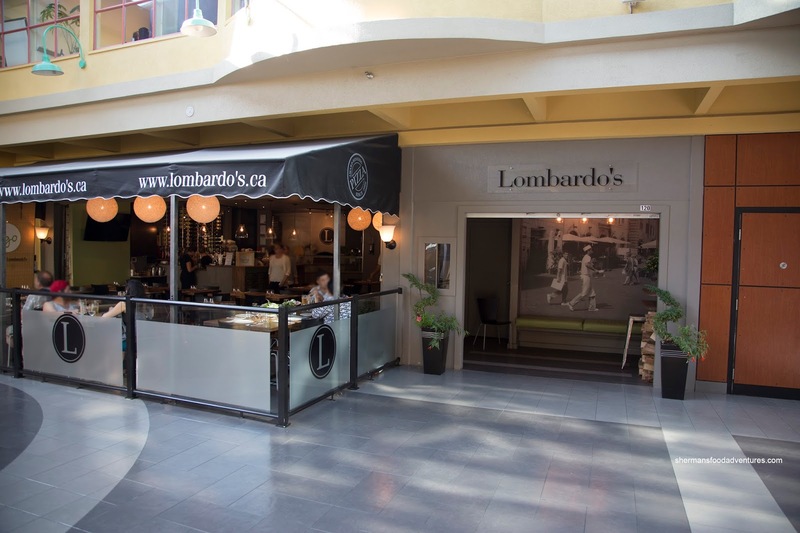 Before the explosion of Neapolitan pizza joints in the GVRD, there was Lombardo's situated in the El Mercato market on the corner of 1st and Commercial. 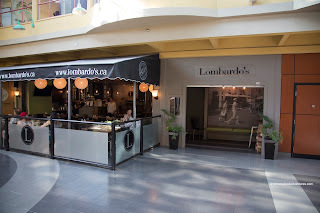 Yes, I was around when it first opened during Expo 86 and have visited the place intermittently since. However, since my last visit was back in 2009, I didn't hesitate to take up an invite. It was about time I got reacquainted to one of the original wood-fired pizzerias in town. To start things off, we were presented with the Heirloom Tomato Focaccia hot from the 800 degree oven. Crunchy throughout with a chewy finish, the crust was properly seasoned and slightly charred. On top, the combination of the tomato sauce and fresh tomatoes ensured that there would be a burst of acidity and background sweetness. The drizzle of garlic oil and balsamic only further amped the aromatics of the flat bread. 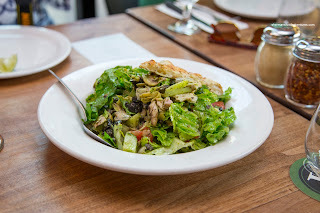 We shared 2 appies next which included the Chef Salad with romaine, tomato, cucumber, ham, artichokes, black olives, mozzarella, mushrooms and house dressing. At first, the light dressing consisting of olive oil, garlic, salt, pepper and white wine vinegar seemed to be lacking impact, but the olives and artichokes offered up the necessary saltiness and tang. With that, there was a balance of flavours as well as textures. In a heaping mound, the large order of Frittura di Calamari was well-prepared. Tender with an appealing natural chewiness, both the rings and tentacles were well-seasoned and fried just right. I found the batter to be paper thin and easy on the grease, but it could've been just a touch crispier. The accompanying Tzatziki was thick and creamy with the usual hits of garlic and lemon. 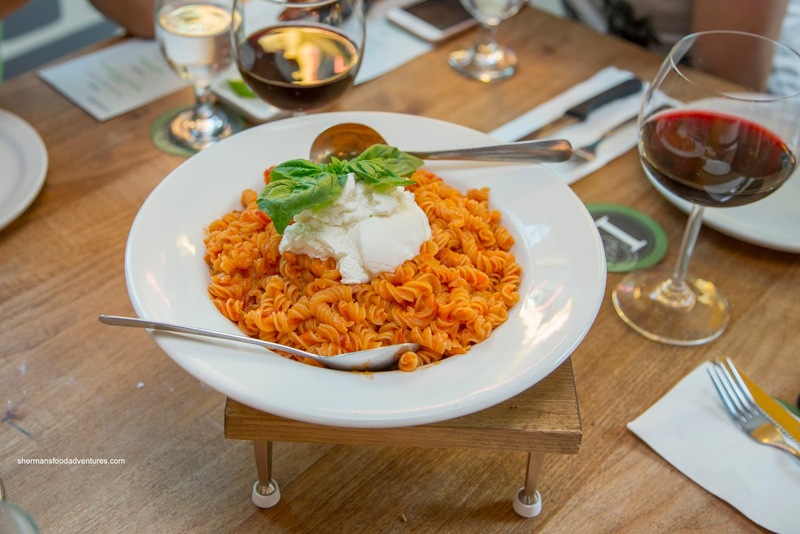 Onto the pasta course, we shared 3 including the Fusilli alla Nonna featuring aglio olio garnished with quark and fresh basil. Lightly sauced while impactful from the chili flakes, the pasta was deceivingly spicy. At first, I got light tomato and garlic accented by the creamy quark, then once past that, the chilis kicked in and lingered afterwards. The pasta here was a bit past al dente. 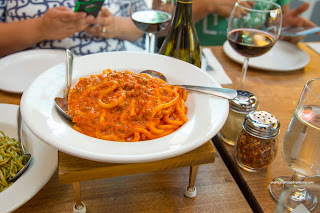 Next, I sampled the Spaghetti Pasticciati employing a thicker version of pasta in a creamy meat sauce. Due to its thickness, the spaghetti was toothsome and stood up well to the hearty sauce. I found the sauce to be just the right consistency where it clung onto each strand of pasta. It was plenty meaty with depth-of-flavour that featured only the slightest tang to with the creaminess. 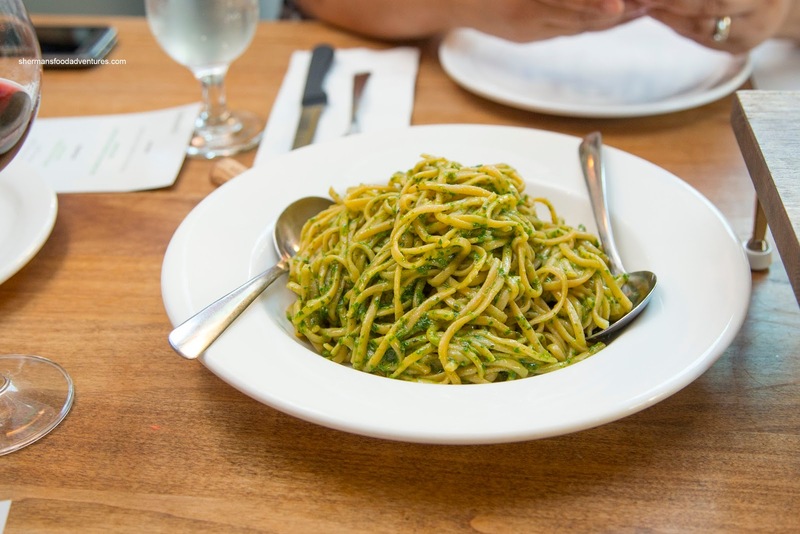 Our last pasta was the Linguine in a Creamy Pesto that was super aromatic. 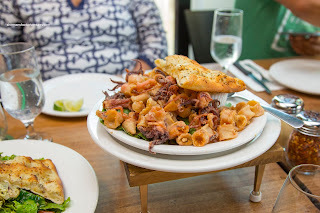 With just enough sauce to coat the pasta, the dish didn't eat as heavy as it appeared. In fact, the strong basil aroma and flavour added a herbaceous brightness. Furthermore, the ample amount of well-seasoned pasta added body so that the sauce on the surface was able to do its thing without needing to do all the heavy-lifting. We then moved to 3 pizzas starting with the classic Margherita made with mozzarella cheese and Italian vine-ripened tomatoes. I found the crust to be crunchy throughout all-the-way to the middle. 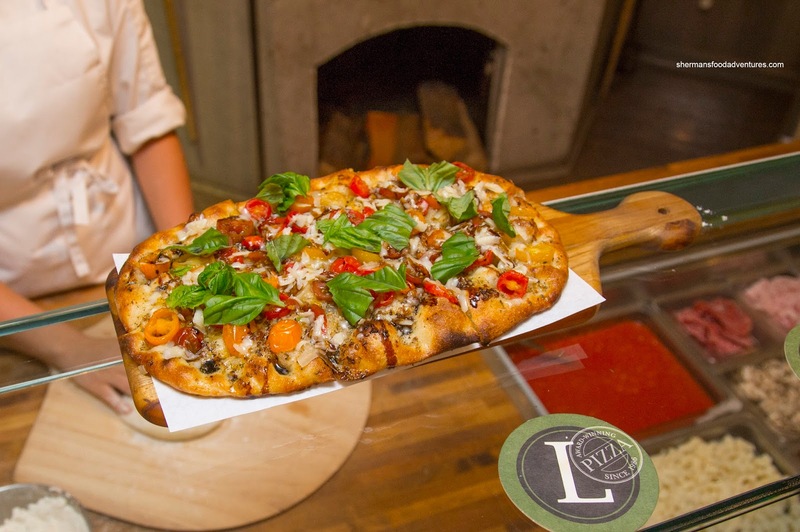 It sported a decent char which added a smokiness to the well-salted and chewy dough. The tomato sauce was lightly acidic and fresh tasting while there was ample mozzarella. I would've liked to see more fresh basil though. 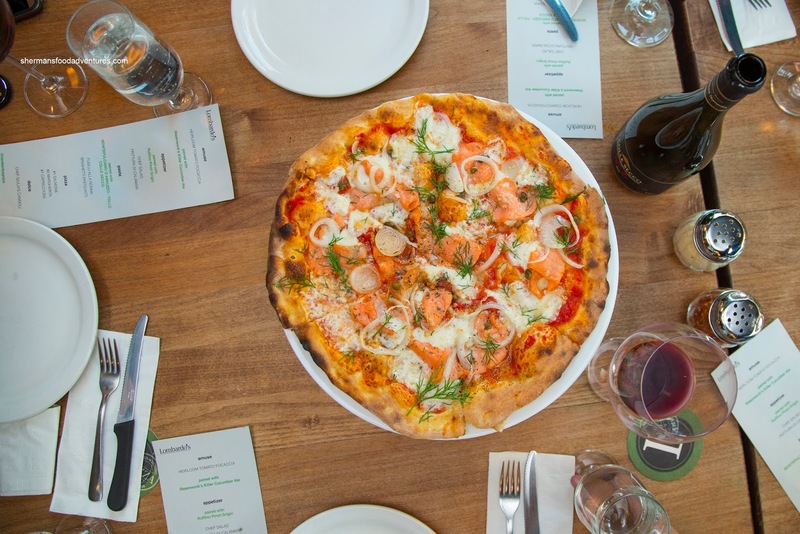 Our next pizza was the Salmone with wild BC smoked salmon, capers, onions, fresh dill and garlic oil. Despite the wet toppings, the pizza crust held up and remained crunchy throughout. As such, I could eat each slice as a whole without anything sliding off. The resulting flavours were classic smoked salty salmon with the extra salty tang from the capers and sweetness from the onions. For our last pizza, we tried the hearty Capricciosa with salami, ham, artichokes, mushrooms and black olives. 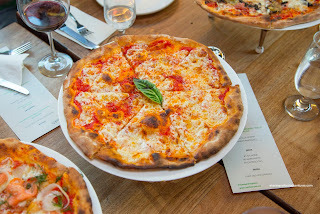 Again, the crust was not affected by the amount of toppings which allowed each bite to be a whole. 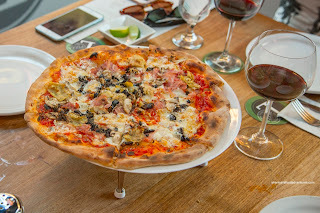 As such, the salty ingredients meant the pizza ate with plenty of flavours including the aforementioned saltiness in addition to the tang of the olives and artichokes as well as the slight pepperiness of the salami. For dessert, we sampled the cute little Cannolis shaped as crunchy mini-cones with the filling acting as the "ice cream". I had the tiramisu flavour and it was sweet and creamy. 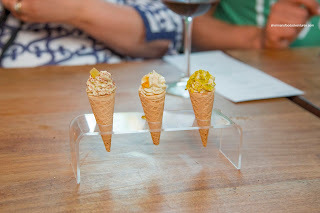 Personally, I still love the classic cannoli, but these little bites were the perfect end to a filling meal. In the end, it was nice to be re-introduced to a classic where the pizzas pastas hold their own against the new spots in town.